A picture’s worth a thousand words. Tell your family’s story! Enter our Faces of Family photo contest for a chance to win great prizes donated by Broadway Camera and be featured in AFABC’s print and online materials! To enter, click the "Register Now" button at the bottom of the page and complete the form. A connection to foster care, permanent guardianship, kinship care, custom adoption, or other forms of permanency. Each entrant can submit up to 10 photos. Winning photos and other selected entries will appear in Focus on Adoption magazine and other AFABC print, digital, and social media channels. By entering the contest, you give permission to AFABC to use your photos publicly in any of our materials, including print and social media. Please ensure you have permission to identify and show the faces of any minors included in your photos. Note: AFABC employees and their family members are not eligible to enter. All contest entrants are automatically included in a draw for this prize! Your everyday life is filled with magic moments. Capture them all with the Canon PowerShot ELPH 360 HS. It features a 20.2MP CMOS sensor and DIGIC 4+ image processor that captures still up to 7.2fps and Full HD video. It has 12x optical zoom that gets you closer to your subject and built-in WiFi and NFC ensures easy sharing with your mobile device. This camera lets you capture and relive all of your greatest adventures and most exciting experiences! It takes 1080p video at 60 frames per second while simultaneously taking photos up to 12MP. Includes mounts, accessories, and 16GB memory card. Snap fun photos with this Polaroid-style instant camera! 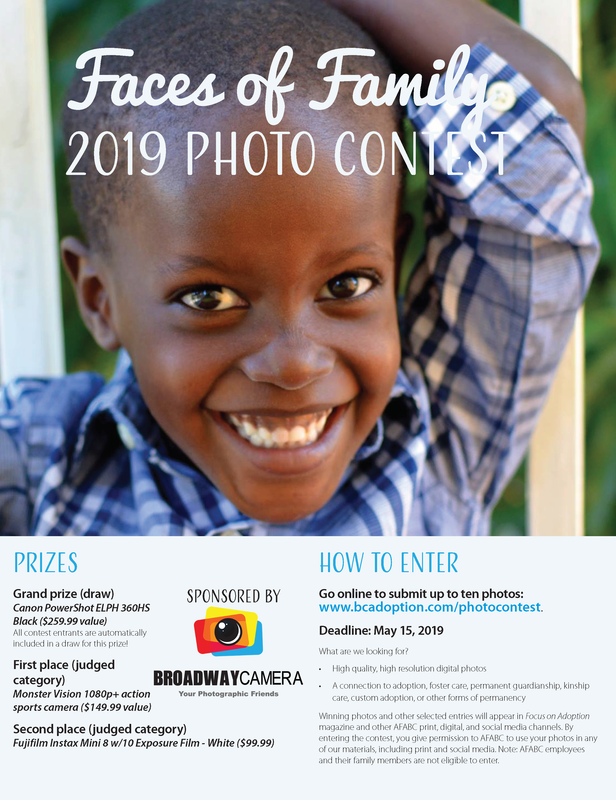 The 2019 Faces of Family Photo Contest (“contest”) is sponsored by Broadway Camera and administered by the Adoptive Families Association of BC (“AFABC”) contest begins on March 11, 2019 at 12 am and ends on May 15, 2019 at 11:59 pm PST (“contest period”). The Adoptive Families Association of BC (AFABC) features photos of real adoptive children, teens, and families from our community throughout our educational and promotional materials. Reflecting the real faces of adoption helps us in our ongoing work to promote, publicize, and celebrate adoption and adoptive families. By entering the Faces of Family photo contest, you give permission to AFABC to use your photos in any of our materials, including print and social media. You confirm that you own the rights to the photos you submit and have have permission to allow them to be reproduced by the contest administrators, and that you have permission to identify and show the faces of any minors included in your photos. Administrators reserve the right to publish entrants’ complete names in conjunction with their submitted photographs, unless otherwise requested by the entrants. All contest entrants will receive one entry (regardless of number of photos submitted) for the grand prize draw for a Canon PowerShot ELPH 306HS digital camera. One grand prize draw winner will be chosen at random using the online random number generator at www.random.org. The odds of winning will depend on the number of entries received. First and second place prize winners will be selected by a committee of AFABC staff. The winners will be contacted by email and will have seven days to respond. If no response is received within seven days, another winner will be chosen. Administrators are not responsible for prize fulfillment nor for any technical failures. Facebook, Instagram, and Twitter are in no way associated with this contest. Contact information for sponsor(s), if applicable, can be found in the contest text via website links. Images included in the contest promotional materials may not depict the exact prize, and are for illustrative purposes only. Please contact bbrashnyberg@bcadoption.com or 604-320-7330 ext 106 for any questions.